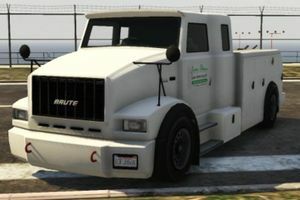 A Utility Truck in Grand Theft Auto V.
The Utility Truck is a series of commercial and industrial vehicles in Grand Theft Auto V.
The light Utility Truck is based on the Vapid Contender pickup truck with a utility bed. The heavy Utility Truck is based on the Brute Stockade and comes in three forms: one with a utility bed, one with a cherry picker and one with a covered rear. A light Utility Truck in GTA V.
A heavy Utility Truck in GTA V (Rear quarter view) with a utility bed. A heavy Utility Truck in GTA V with a cherry picker. A heavy Utility Truck in GTA V with a covered rear. This page was last modified on 14 April 2014, at 18:19.